Last winter I had the opportunity to paddle down the Grand Canyon of the Colorado, alone. For 27 days and 280 miles the Grand Canyon was my world. I reveled in the solitude, played in the rapids, and was continually awed by the magnificent nature surrounding me. The resulting article and video featured by Canoe and Kayak turned out to be one of their most popular stories this year, and I finally decided to sit down and write down some tips for putting a solo trip together. This article will focus mainly on wintertime solos, as those permits are the easiest to snag. Of course most all this information will apply to kayakers looking to prepare for a self-support trip down the Grand Canyon, even if you aren’t doing it alone. Note: Some links in this post are affiliate links. This small income helps pay for hosting and design on the site. Please consider supporting this site and using these links. Additionally, these are items I use and trust. Two books come to mind when it comes to soloing this river, with the first being Canyon Solitude: A Woman's Solo River Journey Through the Grand Canyon. I only skimmed through its pages, although first hand accounts get me stoked for the coming adventure and give little details that can help preparations. 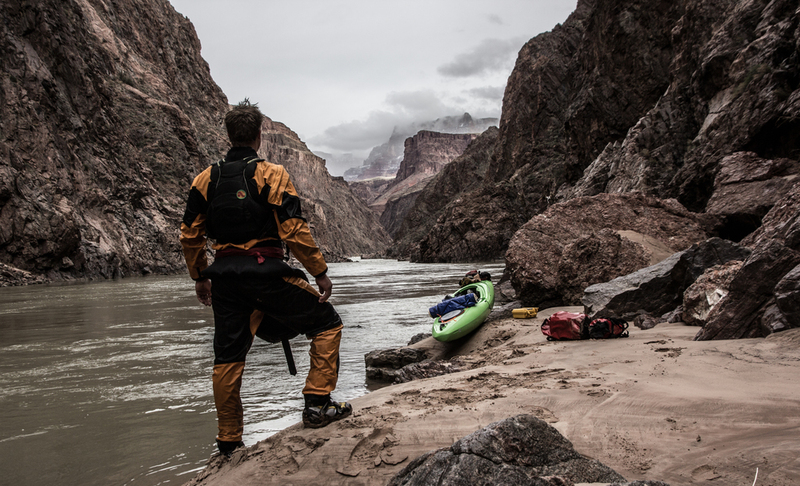 The second is Never Boat Alone: A Guide to Soloing the Colorado River Through Grand Canyon by Bruce Cline. It was a well thought out guide discussing mental preparation, gear lists, dangers of the canyon, and accounts from both kayak and raft soloists. Additionally, Bruce has seven solos under his belt, so he was very knowledgeable to talk to and use as a resource. For a basic, portable river guide I used Belknap’s Waterproof Grand Canyon River Guide. Navigation was easy, even with this simplified version. For information on day hikes and camps I used the 3rd edition of Tom Martin’s Day Hikes from the River. There are more hikes in there than you could ever do, and the campsite information helped determine which camps would be getting lots of sun in the winter months. The first step to any Grand Canyon trip is the permit! Personally I feel that winter permits (Nov 1st – Feb 29th) are both the easiest and best to get. Only one private launch is allowed per day, fires and wood gathering are allowed, and you get up to 25 days to paddle from Lees Ferry to Diamond Creek. This is the true canyon experience, when it’s just you (and possibly a select few), instead of a full river of boaters and blazing hot temperatures in the summer. Sign up in the Non-Commercial river lottery to start competing for launch dates. Don’t be confused by the prices for permits. It’s $400 for a standard group (up to 16 people) and $200 for a small group (up to 8 people). Regardless of whether or not you plan to go solo, you pay this money upfront. Technically it costs $100 in permit fees per person to go down the Canyon. Once you get off the river email the permit office and they will refund you the difference. For example, if you soloed on a $400 standard size permit, they will refund you $300. Make sure to use a credit card and not a debit card for this. In reality the hardest rapids in the Grand Canyon (Lava, Crystal, Hermit, etc.) are in the Class III range. Sure they have a big water feel to them, but as long as you set up for the move correctly, it’s easy going. That being said, ample Class IV experience is a must-have if you’re thinking of soloing. You should be confident to be scout a line, and run it without the risk of swimming. The last thing you want is to see your boat and gear for the trip drifting downstream without you. Most rapids were all straightforward, although Hance gave me pause. Hance is the first ‘big’ one, and is quite long and continuous, which made for an intimidating scout. All that being said I figured the rapids out pretty easily, never having run them previously. A quick note on safety: be very sure of your skills, and cognizant that things could go wrong from even a small misstep on a side hike. I carried a SPOT with me at all times (under my drysuit in my pant leg) as well as an energy bar and matches. This is just a little additional security incase something were to go wrong. There's lots of river traffic in the summer, but people might not come across you for a week in the winter. Be self-sufficient and prepared. One of the most expensive parts of the trip will be the shuttle. There’s really no way to get around that, and you probably don’t want your car hanging out in a parking lot for 3 weeks unattended. I used River Runner Transport on my past trip and it worked out great. Shuttle for one car from Lees Ferry to Pearce Ferry was around $285 + gas. See if they can include your car with a larger transport for a cheaper fare. Also, they store your car at their HQ so it’s not sitting at Lees Ferry the whole time. I’ve thought about stashing my gear at Lees, parking at Pearce, and biking back up, but that will tack an extra 4 days or so onto your trip. It would be dirt cheap and pretty sick to do a bike shuttle before your trip. Menus are personal. I tend to eat the same thing every day while camping – oatmeal for breakfast, tortillas with peanut butter and honey for lunch, and quinoa with onions and salami for dinner. Throw in a lot of oil, nuts, Snickers, and protein powder for energy during a winter trip. 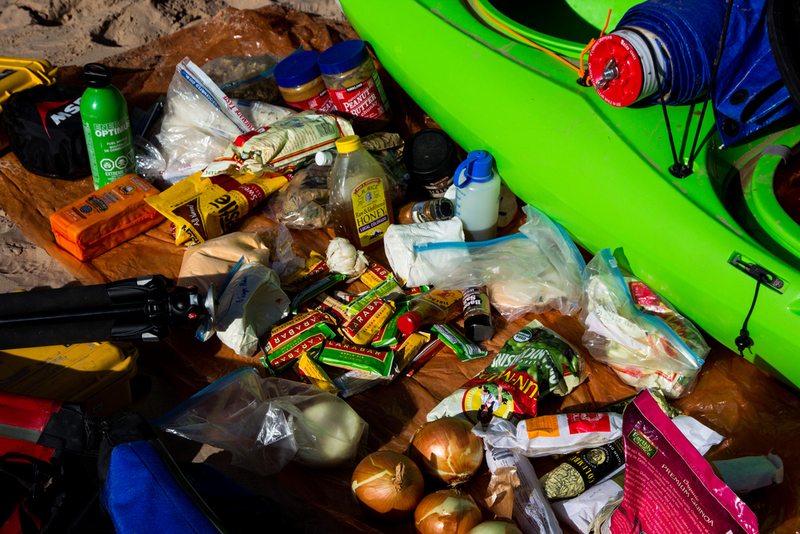 Since you’re self-supporting in a kayak choose foods for their size, not weight. Fats are a great option since they’re the most calorically dense foods. Basically 1 gram of fat will give you 9 calories, whereas 1 gram of protein or carbohydrate will give 4 calories. Practice packing all the food in your boat, and remember not all food has to go in a drybag – sealed containers of peanut butter, etc. can be left free in a hatch or bulkhead. Finally, think about how much food and fuel you’re bringing. I had 27 days of food to haul, so before my launch I hiked down the Bright Angle to Phantom Ranch and dropped off 15 days of food and a gallon of white gas. The rangers down there are great, and will let you store provisions in ammo cans right behind the ranger station. Then I packed and launched at Lees with the 12 days of food left. Also, the ranger gladly took the excess ½ gallon white gas I had leftover when I arrived for the resupply. You’re required to have a firepan in the winter. For this you’ll probably have to build your own since Grand Canyon regulations state it has to be 300 square inches in area, have 3 inch sides, and be elevated with legs. Plus, you want it to be light and easy to breakdown for storage in a kayak. I followed Boyce Greer’s plans and used scrap aluminum from the junkyard to make it light. Note: hot fires will warp & melt aluminum, so use a fireproof blanket or heat buffer. A little crude, but hot fire can incinerate human waste – if you’re wondering how I managed to carry 27 days of it. I made my groover a bit differently, but here are some good build ideas from Boyce’s trips. However you construct it, make sure to allot 40 cubic inches per day per person. As for usage; do your business in a plastic grocery bag, and put the whole package in a groover. This sets up problems for waste disposal with the plastic bags, but its really the only system for kayakers. 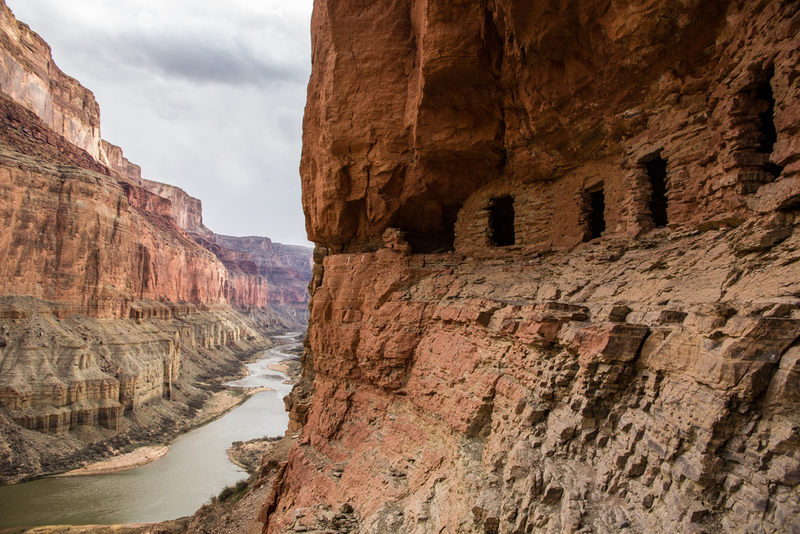 Oh, and don’t forget that there are outhouses at Phantom, at Pipe Creek (Bright Angel Trail junction with Colorado river), and a hidden bathroom among the campsites at Deer Creek. Aside from those facilities, you need to carry that waste out. Renting boats from the Flagstaff area outfitters is pretty cheap – around $20 per day. That cost can add up for a long trip though. I decided to get a Dagger Katana 10.4 for the trip, and it worked incredibly well. I’d recommend the Katana to anyone, and props to Colorado Kayak Supply for getting the boat to me quickly. The Liquidlogic Stinger XP is all the rage for self-support trips, but a couple details make it a weak contender to the Katana. The XP lacks any sealed bulkhead system, so if you swim you have to empty 100 gallons of water from the boat – nearly 800 pounds! The hatch isn’t completely waterproof, and its long length makes it hard to surf without burying the bow on anything but the fastest green waves. The Katana has a watertight rear hatch, deployable skeg, sealed rear bulkhead, and is short enough to surf waves in control while still having the speed to move downriver quickly. Disclaimer: I blew the hatch once while plugging a big hole in Crystal – other than that it performed super well. It also has more usable packing space overall compared to the XP since the Katana has a stubbier design, so the bulkhead in front of the feet can be utilized as well as the full stern. Finally, the Katana operates like a 9’ race boat. 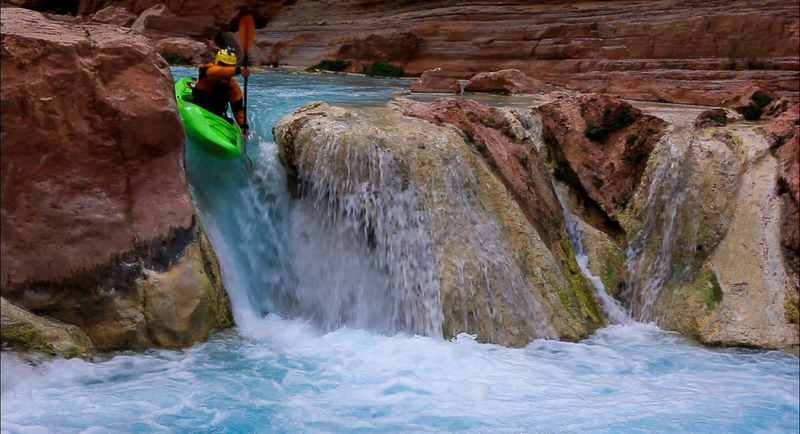 Check out my video teaser for a shot of some Katana boofing on Havasu Creek. The Canyon is fairly dry in the wintertime, so an expedition tent is overkill – especially if you’re soloing. I brought a cheap tarp with some nylon cord. I ended up using it three nights (out of 27) for rain, but the rest of the time I slept under the stars. I’d say this is the best way to go as not only does it save space and weight, but you can roll the tarp with your groover and strap them to the top deck of your kayak. If you’re sleeping outside bring a warm sleeping bag. I brought a 0 degree bag and found it too warm by the end, but was mighty comfy on the freezing nights at the start. Temperatures are variable, but by late February I was wearing a bathing suit in 70 degree weather at the takeout! Wear one. No exceptions, especially if you’re solo. It’s the most comfortable, safest piece of gear to have on the river. And you can get them for as cheap as $280 these days. I’ve covered the gear people may have questions about on the river. Of course you’ll need all the standard boating gear – breakdowns, throwropes, whistles, first aid kits, etc. Here’s a full list of regulations and requirements. If you’ve made it this far, thanks for reading! Hopefully you’re well on your way to a slow, awe-inspiring trip down the Grand Canyon of the Colorado. Look forward to multi-day layovers at prime campsites as you hike and explore, with the whole Canyon to yourself. Welcome to long nights with lots of sleep, and possibly the best river experience in the lower 48. Enjoy! Any questions? I'd be happy to answer them, just add a comment below. Enjoy this? Sign up for email updates from the site. No spam, I promise! Sign up to receive a monthly newsletter from the site.